It’s been a busy past couple of weeks at Bethpage Ballpark! With the Atlantic League awards season now wrapped up, the focus has shifted primarily towards the 2019 season. In recent days, the league’s schedule has been announced for next season, featuring the addition of the High Point Rockers to the eight-team circuit. The North Carolina-based club, which will replace the Road Warriors in the Liberty Division. The league-operated Road Warriors bridged the one-year gap between the end of the Bridgeport Bluefish lease and the completion of construction of the new High Point ballpark, which is slated to open on May 2, 2019. With a schedule now in place, the Ducks also debuted the team’s official logo for the 20th Anniversary Season (pictured above), which will be celebrated in 2019. The logo will be featured on promotional items, merchandise and marketing platforms leading up to and throughout next year. Two games that are always circled on the calendar of every baseball fan are Opening Day and the Home Opener for their favorite team. Sometimes, they end up being on the same date. However, for the Ducks, it has almost always proven to be on separate dates. 2019 will mark the ninth consecutive season in which Long Island begins the season on the road, as they will open against the York Revolution in Pennsylvania. The Ducks and Revs will play a three-game series to kick off the season, with the opener taking place on Friday, April 26th at PeoplesBank Park. The Ducks last opened the season in York on April 24, 2015, coming away with a 5-2 victory. Meanwhile, the Ducks will return home following a week-long trip in Pa. for the Home Opener, which will take place on Friday, May 3rd. Coincidentally, that game will also be against the Revolution, who will be in town for a three-game weekend series. The last time the Ducks played their Home Opener against York was in 2014, when the Flock fell 6-1 on May 2nd. After a thrilling Atlantic League Championship Series in 2018 that saw the Ducks and Skeeters need a decisive Game Five to determine a league champion, Ducks fans will surely be wondering when the two sides will collide again. Long Island will face Sugar Land, looking to exact a measure of revenge after this past season’s tough series loss, in Texas from May 10th-12th. Constellation Field was the site of that memorable Game One between the sides that took 13 innings and a total of four hours, 57 minutes. The Ducks will host the Skeeters for the first time in 2019 on Memorial Day Weekend, May 24th-26th, which will mark Sugar Land’s first visit since celebrating the 2018 championship at Bethpage Ballpark. As we detailed earlier, the High Point Rockers will be making their debut in the Atlantic League this season. There is always excitement around a new club when it enters the league, and this should be no different. The team will be playing their home games in a brand new, state-of-the-art ballpark and for a fan base that has shown tremendous support in anticipation of the team’s arrival. The Ducks are slated to get their first look at the Rockers and BB&T Point Ballpark when they make the trek to High Point, N.C. for a three-game set May 21st-23rd. Meanwhile, the Rockers will make their first visit to Long Island for a three-game weekend series June 7th-9th. 2018 saw the Ducks and Patriots both clinch postseason berths and meet in the Liberty Division Championship Series for a fourth consecutive year. In what has become an annual installment between the two teams, fans around the Atlantic League often expect the two sides to be in close division races down to the wire during each half. Last year, the two teams played all of their meetings in each half early, with clubs wrapping up their nine first half games against one another by May 27th and their second half meetings by August 8th. That prevented the teams from playing some tense, dramatic games late in the halves. This year will be a different story. Long Island and Somerset will meet nine times in the first half, all during the month of June. During the 20-day span between June 11th and 30th, Long Island will host Somerset for three games and visit the Patriots twice, including a three-game set at TD Bank Ballpark June 28th-30th after which there are just seven games left in the half. These matchups could very well decide the first half Liberty Division champion. Should the Ducks be battling another team for the first half title, June will still be an important month. Of Long Island’s 28 games in June, 23 are against Liberty Division opponents. The Ducks and Patriots will also face off in two important series against Somerset late in the second half, hosting Somerset for four games August 19th-22nd and three more games August 30th-September 1st. The Ducks and the Fourth of July have almost become synonymous with one another on Long Island. Fans have frequently been able to enjoy celebrating the holiday at Bethpage Ballpark in recent years, with the team often having home games on and around the holiday. However, 2018 represented a rare instance when that was not the case, as the team played a three-game set in New Britain July 3rd-5th. That marked just the second time since 2011 the Ducks did not have a home game on July 4th, with 2016 being the other as the team played in Lancaster. However, Long Island hosted home games July 1st-3rd. This year, the Ducks will be back home for a seven-game homestand during the first seven days of July. Long Island will host a four-game series against the Skeeters July 1st-4th to begin the month before welcoming in the Blue Crabs for a three-game set to wrap up the first half. While fireworks dates have yet to be announced, fans can expect to enjoy the best fireworks show on Long Island July 4th! Stay tuned for the announcement of additional fireworks shows, as well as the full promotional schedule. It has not been often that the Ducks have finished the regular season at home in recent years. During each of the past two seasons, the Ducks have ended their year in Texas against the Skeeters, needing road wins to clinch a playoff berth in each season. In fact, you must go all the way back to 2014 to find the last time the Ducks ended their regular season at home. That year, Long Island ended their season with a six-game homestand, including three against the Barnstormers and three against the Blue Crabs. Now, five years later, the Ducks will end the 2019 season with three home games. The Rockers will come to town for the series the weekend of September 20th-22nd. Though the Ducks hope to have a postseason spot clinched prior to that point, it is typically a bit more comfortable for a team to be playing in its home ballpark for games with added importance. Which games are you most looking forward to in 2019? Let us know in the comments section of this post! The Ducks have reached the Atlantic League Championship Series for the third straight season, and for the second time in those three years, they will play the Sugar Land Skeeters. The Ducks jumped out to a big lead and held it last night, winning 6-3. Long Island won the 2018 regular season series against the Skeeters by a margin of 10-8, winning five of nine games at home and in Texas. The Ducks won seven of nine second-half games against Sugar Land, including a 4-2 series win to close out the 2018 season. Long Island is coming off a five-game LDCS victory over the Somerset Patriots, while the Skeeters took game five of the FDCS against the Lancaster Barnstormers. 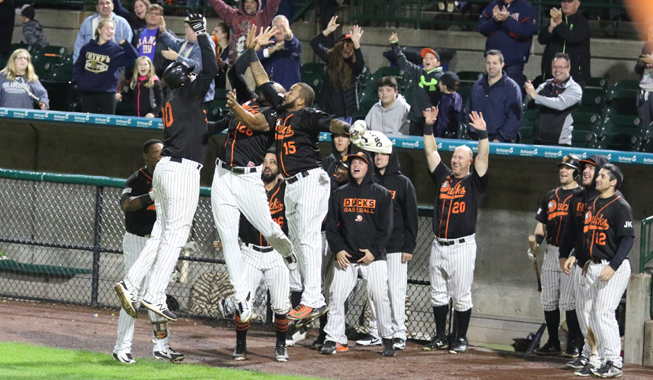 Two runs in each of the first three innings were all the Ducks needed to force a decisive game five in the Atlantic League Championship Series. Sugar Land grabbed an early 1-0 lead in the first inning on a two-out RBI double to right field by Matt Chavez off Ducks starter Dennis O’Grady. Long Island responded right away in the bottom of the inning, as Jordany Valdespin and Daniel Fields scored on wild pitches by Skeeters starter Dallas Beeler. The Ducks extended their lead to 4-1 in the second with three consecutive two-out hits, including a two-run double to right by Valdespin. Two more runs in the third on a two-out, two-run single to center by Cody Puckett widened Long Island’s advantage to five. The Skeeters closed to within 6-2 in the seventh on Alvaro Rondon’s RBI single to left. Another run in the ninth on back-to-back two-out doubles by Albert Cordero and Denis Phipps made it a 6-3 ballgame, but pinch-hitter Javier Betancourt then struck out to end the ballgame. O’Grady earned the win, tossing seven innings of two-run ball, allowing six hits and two walks while striking out four. Beeler suffered the loss, surrendering six runs on seven hits and a walk over two and one-third innings with five strikeouts. Carlos Pimentel and Fernando Abad pitched the eighth and ninth innings, respectively, to secure the win. In a matchup identical to game one, Jake Fisher will close out the postseason for the Ducks. The 2018 Atlantic League All-Star was 8-7 this season with a 3.91 ERA winning three of his last four starts. In the first game of the series, the lefty allowed just two runs through six and two-thirds innings, giving up just four hits in a no-decision. The Oklahoma native has been great against the Skeeters this season, owning a 3-1 record and 0.67 ERA in four regular-season starts (22 innings) against Sugar Land. James Russell will man the rubber for the Skeeters in the decisive Game Five. The seven-year major league veteran was 8-4 with a 2.36 ERA after joining Sugar Land in late May, making 20 appearances (18 starts). The southpaw made two appearances against the Flock in the regular season, throwing five scoreless innings and giving up three hits through two appearances (one start). In Game One of the series, the Texan gave up a first-inning three-run home run, but did not give up a run for the next five innings despite allowing nine runs and walking four. Russell has played with the Chicago Cubs, Atlanta Braves, and Philadelphia Phillies, making 394 MLB appearances to the tune of a 4.09 ERA from 2010 to 2015. Fans can follow all the action for today’s game, and every Ducks game in 2018, on the Long Island Ducks Broadcast Network. Live streaming HD video and audio via BoxCast will be available on the team’s official Facebook page through Facebook Live, on the Ducks’ official YouTube channel and at LIDucks.com in the Ducks Video Center on the homepage. In addition to updates in this post, fans can follow a pitch-by-pitch account of today’s game via Pointstreak’s Game Live application by CLICKING HERE. For today’s full Ducks game notes, please CLICK HERE. For the Ducks complete playoff history, please CLICK HERE. TOP 2: A two-out home run by Denis Phipps gives the Skeeters a 1-0 lead. TOP 3: An Albert Cordero RBI single gives the Skeeters a 2-0 lead. BOT 5: Dan Lyons gets the Ducks on the board with a solo homer to left! Ducks trail 3-1. TOP 6: Skeeters put up another, extending their lead to 4-1. FINAL: The Ducks are unable to comeback, and the Skeeters win the 2018 Atlantic League Championship by a score of 4-1. The Ducks have reached the Atlantic League Championship Series for the third straight season, and for the second time in those three years, they will play the Sugar Land Skeeters. After a dramatic victory last night, the Ducks extended the series to a fourth game. Long Island won the 2018 regular season series against the Skeeters by a margin of 10-8, winning five of nine games at home and in Texas. The Ducks won seven of nine second-half games against Sugar Land, including a 4-2 series win to close out the 2018 season. Long Island is coming off a five-game LDCS victory over the Somerset Patriots, while the Skeeters took game five of the FDCS against the Lancaster Barnstormers. The Ducks had their backs against the wall until an eighth-inning comeback, winning 3-2 in what could have been their last game of the season. Both teams would then trade zeroes until the bottom of the eighth inning. Ramon Cabrera blooped a double down the right-field line with two outs off reliever Dan Runzler. That set the stage for David Washington, who followed with a two-run home run to right-center on a 1-0 pitch. Neither starter factored into the decision. Barcelo tossed seven innings, allowing two runs (one earned) on six hits and a walk while striking out five batters. Irvine pitched four innings, yielding a run on four hits and two walks with three strikeouts. Carlos Pimentel earned the win with a scoreless eighth inning, yielding a hit while striking out one. Runzler took the loss, conceding two runs on two hits in one inning while striking out two. Fernando Abad pitched a scoreless ninth to earn his first save of the playoffs, striking out one. Game four of the series will see Dennis O’Grady get the start for the Flock. The right-hander went 6-4 this season with a 3.81 ERA in 52 games (four starts), leading the team in appearances. O’Grady starter the decisive Game Five in the Liberty Division Championship Series, taking a no-decision after allowing two runs on six hits and two walks. The Floral Park native gave six earned runs in 17.1 innings in the regular season as a starter, good for a 3.12 ERA. O’Grady faced the Skeeters five times this season, with the last one being a start. As a reliever, he pitched 3.2 scoreless innings against Sugar Land, yielding just one walk while striking out two. In his final start of the season against Sugar Land, the Duke University Alum took a 3-1 loss despite dealing a quality start. Dallas Beeler will be called upon by the Skeeters in his second stint with the team this year. Overall, Beeler had a brilliant 2.29 ERA this season along with an 8-2 record through 19 appearances (14 starts). The righty had his contract purchased by the Kansas City Royals in July, but had an ERA over 13 in four appearances at the Double-A level. Since returning to the Skeeters, Beeler has a 3.54 ERA and has given up over five hits in six of his nine appearances. Beeler did not play professionally last year and had five Major League starts with the Chicago Cubs in 2014 and 2015. For tonight’s full Ducks game notes, please CLICK HERE. For the Ducks complete playoff history, please CLICK HERE. TOP 1: Skeeters drive in a run with an RBI double by Matt Chavez. BOT 1: A couple of wild pitches give the Ducks a 2-1 lead! BOT 2: A two-run double for Jordany Valdespin gives the Ducks a 4-1 lead! BOT 3: For the third straight inning, the Ducks put a pair of runs on the board! This time it’s a Cody Puckett single doing the damage! 6-1 Ducks! TOP 6: Dennis O’Grady only needs six pitches to retire the side with the Ducks ahead 6-1! TOP 7: Skeeters get a run back, but it’s still 6-2 Ducks. The Ducks have reached the Atlantic League Championship Series for the third straight season, and for the second time in those three years, they will play the Sugar Land Skeeters. The Ducks are in a 0-2 hole after a blowout victory for the Skeeters in game two. Long Island won the 2018 regular season series against the Skeeters by a margin of 10-8, winning five of nine games at home and in Texas. The Ducks won seven of nine second-half games against Sugar Land, including a 4-2 series win to close out the 2018 season. Long Island is coming off a five-game LDCS victory over the Somerset Patriots, while the Skeeters took game five of the FDCS against the Lancaster Barnstormers. It was all Sugar Land in Game Two, featuring 10 Skeeter runs and a complete game shutout. Sugar Land opened up the scoring with a four-run third inning (one earned) against Ducks starter Matt Larkins. A sacrifice fly off the bat of Juan Silverio, an RBI single by Matt Chavez and a two-run double by Tony Thomas did the damage. Barrett Barnes extended the lead to six with solo home runs to left in the fourth and sixth innings. A two-run homer to left by Tony Thomas in the seventh and a pair of runs in the eighth rounded out the scoring. Skeeters starter Konner Wade earned the win with a complete game shutout. He allowed just seven hits and no walks while striking out 11 batters. Larkins took the loss, yielding six runs (three earned) on eight hits and three walks over five and two-thirds innings with two strikeouts. Lorenzo Barcelo will be counted on in the crucial third game of the series. This season, the 41-year-old went 2-1 with a 4.20 ERA in 12 appearances (five starts). Barcelo started Game Four of the LDCS, falling to the Patriots by a score of 5-3 after giving up five runs on nine hits and striking out five over six innings. The Dominican Republic native has played professionally for 18 years, reaching the big leagues from 2000 to 2002 with the Chicago White Sox, tallying 66 innings with a 4.50 ERA. Lucas Irvine starts for the Skeeters looking for the sweep. The fourth-year Atlantic League veteran was acquired from the American Association on August 17th and was a great addition, going 1-1 with a 2.55 ERA in six starts. The righty earned a win in his lone postseason start against the Barnstormers, allowing two runs on seven hits in five and one-third innings. Irvine was originally drafted by the Rays and is a veteran of the American Association, Canadian-American Association, and the Mexican League. TOP 1: Skeeters strike first with an RBI double off the bat of Albert Cordero. TOP 2: Lorenzo Barcelo works out of a two-one no-out jam to keep the Ducks within one! TOP 3: Tony Thomas drives in the second run of the ballgame for the Skeeters, they lead 2-0. BOT 3: Lew Ford gets the Ducks on the board with an RBI double! Ducks trail 2-1. TOP 4: Lorenzo Barcelo only needed four pitches to get through the frame, keeping the score at 2-1 Skeeters. TOP 5: Lorenzo Barcelo strikes out the three batters he faces in the fifth! Still 2-1 Skeeters. BOT 8: DAVID WASHINGTON GIVES THE DUCKS THEIR FIRST LEAD OF THE NIGHT WITH A TWO-RUN HOMER TO RIGHT! IT’S 3-2! FINAL: Ducks win 3-2 after the huge 8th inning blast by David Washington! Game 4 tomorrow night! The Ducks have reached the Atlantic League Championship Series for the third straight season, and for the second time in those three years, they will play the Sugar Land Skeeters. The Ducks are looking to bounce back from a series-opening loss that required extra innings. Long Island won the 2018 regular season series against the Skeeters by a margin of 10-8, winning five of nine games at home and in Texas. The Ducks won seven of nine second-half games against Sugar Land, including a 4-2 series win to close out the 2018 season. Long Island is coming off a five-game LDCS victory over the Somerset Patriots, while the Skeeters took game five of the FDCS against the Lancaster Barnstormers. The Atlantic League Championship Series began the same way both Division Series ended: in extra innings. The Skeeters were able to walk off in the 13th to take a 1-0 series lead by a score of 5-4. Lew Ford gave the Ducks an early 3-0 lead with a three-run home run to left field in the opening inning off Skeeters starter James Russell. It stayed that way until the bottom of the fifth when Sugar Land closed to within one on an RBI single by Anthony Giansanti and a sacrifice fly to center by Juan Silverio off Ducks starter Jake Fisher. The Ducks stretched their lead back up to two in the top of the eighth on a mammoth solo homer to left by Cody Puckett. However, a two-run bottom of the inning for the Skeeters against reliever Jose Cuas tied the game at four. A two-out RBI single to right by Tony Thomas followed by an RBI double to left from Derek Norris did the damage. Both sides would wiggle into and out of trouble over the next four innings. Long Island threatened to take the lead with back-to-back walks to begin the 13th inning, but they could not push across the go-ahead run. In the bottom of the inning, Sugar Land loaded the bases on two singles and a walk. That set the stage for Javier Betancourt, who ended the game with a sac fly to center that scored Thomas. Neither starter factored into the decision. Fisher lasted six and two-thirds innings, allowing two runs on four hits and four walks while striking out four. Russell pitched six innings, giving up three runs on nine hits and four walks with five strikeouts. Michael Mariot collected the win after pitching a scoreless 13th inning, working around three walks and striking out two. Hector Silvestre took the loss, giving up the winning run on two hits and three walks over one and two-thirds innings of relief. Matt Larkins looks to continue his strong postseason and split the series before leaving Texas. The right-hander made two appearances in the LDCS, starting and winning Game One, and converting the series-clinching save in Game Five. In the series-opener, Larkins allowed two runs in six innings in a 9-2 victory. The Idaho native ended the season with a 7-5 record and 4.55 ERA through 19 appearances, including a complete game shutout. Larkins has started against Sugar Land twice this season, dealing eight shutout innings and allowing just four hits. Konner Wade will be handed the ball in Game Two for the Skeeters. Wade was blown out in his lone postseason start, allowing seven runs (six earned) on eight hits in just two innings of work in Game Three of the series. Wade’s final start of the regular season came against the Ducks, where he gave up four runs (one earned) on three hits and one walk in a 4-2 loss. The Arizona native ended the season with an 8-6 record and a 3.09 ERA that ranked fourth in the Atlantic League. Wade was 1-2 in four starts against the Ducks this season, giving up 19 runs (13 earned) in 22 and one-third innings for a 5.24 ERA. UPDATE: The Skeeters have announced that first pitch for Game Two of the Atlantic League Championship Series is now slated to take place at 7:50 p.m. Our pre-game show will begin at approximately 7:35. After a 50-minute rain delay, we are underway at Constellation Field in Game Two of the Atlantic League Championship Series! END 1: Both Konner Wade and Matt Larkins toss a scoreless first inning of the ballgame. BOT 3: Skeeters collect four hits and take advantage of two errors to take a 4-0 lead after three. BOT 4: A leadoff solo homer to left-center by Barrett Barnes makes it a 5-0 ballgame. BOT 6: Another solo homer by Barnes makes it a 6-0 ballgame. 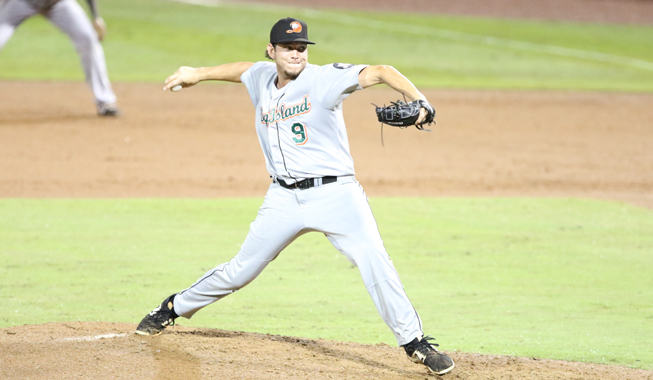 However, Thomas Nicoll comes in and strikes out Juan Silverio in his Ducks debut! BOT 7: A two-run homer to left by Thomas adds to Sugar Land’s lead. FINAL: Sugar Land takes Game Two over the Ducks. We’ll see you back on Long Island Friday night at Bethpage Ballpark for Game Three!